I totally disagree with him of course. With the right balance and focus a hammock can lend itself to hours of fun, but that’s a different story. This one is about the Mother City’s comedians.Some are ‘funny-ha ha’ and some are just ‘funny-weird’. I’ll focus on one who is ‘funny-ha ha’ for now. The devilishly talented, Mr Rob van Vuuren.You might know him better as Twakkie from The Most Amazing Show’s comedy duo, Corne and Twakkie or the winner of Strictly Come Dancing, or the presenter on SA’s Got Talent– yes, this man is not just a hat rack! 1 x Marmite (I need to buy a lifetime supply, so one tub will do). What’s your favourite restaurant in Cape Town? Café Royale in Long Street for the best burgers in town. Good thing I brought you to Jardine then. You can make it up to me by grabbing me a cappuccino. Off I scuttled and 10 minutes later I had our cappuccinos. Well, one latte and one cappuccino, the order was a bit complicated for the understaffed deli. What comes to mind when I say ‘comic genius’? You’ve recently joined the team at 2Oceansvibe Radio, what are you up to there? Well, I do a Drive time show on Thursdays from 3 – 6pm with fellow comedian Martin Evans. It’s all very anti-establishment and fun. At the moment we are desperately looking for sponsorships so please tune in and spread the word. You’ve become a father, how’s parenthood treating you? It has irreversibly, irrevocably changed my perspective and priority list. I have learnt to love and how to be loved. It’s the most beautiful lesson. Plus sleeping is overrated. Give me nappies over sleep any day! I dug into my bag to see if I perhaps had a nappy but then remembered I hadn’t worn those since the early 80’s and probably won’t wear one again until my early 80’s. What are Corne and Twakkie up to these days? At the moment, they’re preparing for the Grahamstown festival and also just making a mess of things. At least Corne is and Twakkie is cleaning it up. As I got up to throw away my box of juice I noticed that Rob started tweeting on his Blackberry. The man is a Twitter champion; I mean there are literally donkeys walking around in cyberspace without hind legs! We continued. Any up and coming shows? I’m currently working on my one man show Rob van Vuuren Live. I’ll be taking it to George and then hopefully to a theatre near you. We both sat in silence for a few moments: him perhaps pondering why he chose to take his show to George and me wondering why George even exists. The sudden silence marked the end of our interview. After all, Rob had to be in a million places and be funny – he truly is a comic genius! And on a more personal note I wanted to continue my thumb twiddling – I have a record of 192 to break. 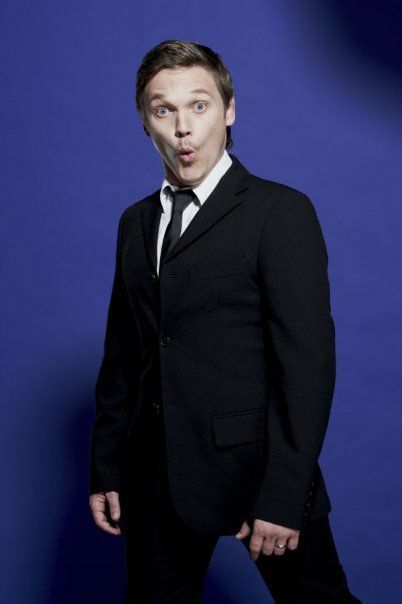 Catch Rob van Vuuren at comedy clubs in the city like Purple Turtle and Zula Bar in Long Street. Phone venues for line-ups. And if you happen to live in George – we’re sorry! I have always felt that Gandhi and I have a lot in common. Apart from the fact that we could both quite easily slip into a dhoti (not to be confused with a Roti) we are not easily provoked. At least that’s what I thought until I invited my comically challenged friend, Jenny, to accompany me to watch, new comedian on the block, Dylan Skews, in his first one man show, Skews Me. ‘Excuse Me’ she said again… as you can imagine this went on for quite some time. Finally we agreed to meet at the new On Broadway Theatre in Long Street. I waited patiently downstairs at the restaurant. The staff was friendly and the menu seemed reasonably priced. In keeping with the comedy theme, I ordered the cheese platter for two and decided to check my Facebook on my phone (a foolproof way to look busy while you are being stood up). I noticed Jenny’s status: ‘In Broadway in New York about to watch a show’. I commented that she was at the wrong On Broadway and she should get on the first plane back to Cape Town. ‘The one in Greenpoint?’ she replied. ‘No it’s moved to the city centre” I retorted before she hit back with: ‘Oh Shortmarket Street?’ I finally slayed her with: “It moved again to Long Street”. The staff informed me that the show was about to start. I paid my bill and walked next door to Boo Radleys, a quaint pub with beautiful leather couches and checkered floors. I had a shot of tequila to calm my nerves and suddenly remembered I hate tequila (the Mexican devil drink) and that it makes me feel quite ill. The barman then offered me a Suitcase instead. I explained that I already had a handbag and that the theatre was just upstairs, I wouldn’t need any luggage. He explained that a ‘Suitcase’ was in fact a shot of whiskey and passion fruit. I apologised and took him up on his offer. I slowly made my way up to the theatre. As I arrived the last of the audience members, still hysterical with laughter, were leaving the venue. The show was over. I cursed Jenny, tequila and luggage and asked the staff if I could have a peek at the stage. It’s a beautiful theatre, with thick red curtains surrounding the 200 raked seats. There was nobody around and I decided to jump onto stage and sing Celine Dion’s All by myself. Suddenly I was ushered out by a friendly yet stern front of house manager. I explained to them that my best friend stood me up for America, that I can’t hold my liquor and that I had to write about their venue. They offered me two tickets to Big Boys don’t Dance – a dance/comedy on at On Broadway (the one in Long Street) in March. I thanked them and called a taxi. I got home, de-friended Jenny instantly on Facebook and then tweeted about taxi drivers who don’t stick to the speed limit in town. I woke up with a hangover, sent a friendrequest to Jenny and tweeted about how I shouldn’t tweet after drinking. Big Boys don’t Dance is on for one week only, 1 – 5 March 2011. R95 per person. On Broadway, 44 Long Street. Show starts 8:30 pm. Book @ 021 424 1194.